A surprising finding. The genetic basis of many epileptic encephalopathies and familial epilepsies remains unknown. Novel sequencing technologies such as Next Generation Sequencing now offer the possibility to identify the genetic basis of these conditions. However, it is a rare event that a single gene is implicated in two completely different epilepsy subtypes. Such a finding has now been reported in Nature Genetics. The KCNT1 gene is found to be mutated in Malignant Migrating Partial Seizures of Infancy (MMPSI) and a severe form of Autosomal Dominant Nocturnal Frontal Lobe Epilepsy (ADNFLE). I doublechecked at least three times whether both papers actually talk about the same gene. The KCNT1 channel. Mutations in the gene cause Autosomal Dominant Nocturnal Frontal Lobe Epilepsy (ADNFLE) and Malignant Migrating Partial Seizures of Infancy (MMPSI). ADNFLE. ADNFLE is a familial epilepsy syndrome, which is characterized by nocturnal frontal lobe seizures. Nocturnal frontal lobe seizures are very distinct events that are characterized by nocturnal arousal, screaming, violent movement of the legs (bipedal automatisms) and sometimes the feeling of choking. These events are often difficult to tell apart from sleep disorders (parasomnias). The genetic basis of ADNFLE is the very start of modern epilepsy genetics. As the first epilepsy gene, a mutation in CHRNA4 was reported in a large Australian family with ADNFLE in 1995. Further families were found to have mutations in CHRNB2 and CHRNA2. All three genes code for nicotinergic acetylcholine receptors, which appeared to be the unifying molecular genetic theme for ADNFLE until the recent report by Heron and collaborators. Several families had been reported in the literature, where nocturnal frontal lobe seizures are accompanied by psychiatric features and intellectual disability. Most of these families were found to be negative for mutations in the three previously known genes. Using exome sequence, Heron and collaborators identified mutations in KCNT1 in an Australian family with six affected individuals. Mutations were also found in three additional smaller families. In most patients the epilepsy was more severe than in patients with mutations in genes for nicotinergic receptors and there was a higher degree of psychiatric problems and intellectual disability. MMPSI. Malignant Migrating Partial Seizures of Infancy is a severe epilepsy syndrome that starts in the first six months of life. This severe epileptic encephalopathy is characterized by a wide spectrum of focal seizures and arrest of psychomotor development. On EEG, seizures can be observed to arise almost randomly from various regions of the brain. Seizures may migrate from one brain region to another, which is an extremely unusual feature and has given MMPSI its name. Initial MRI images are normal, and except for two patients with mutations in SCN1A, the cause of MMPSI was unknown. MMPSI is rare with less than 100 patients described worldwide. Using exome sequencing, Barcia and collaborators identified mutations in 2/3 patients with MMPSI. Thez followed the finding up in 9 other MMPSI patients. In summary, 6/12 patients with MMPSI were found to have de novo KCNT1 mutations. Interestingly, 3 patients were found to have the same de novo mutation (p.Arg428Gln). The authors investigated the functional consequences of these mutations in Xenopus oocytes and found that the mutations resulted in an activiation of the KCNT1 channel. SLICK and SLACK. KCNT1 and KCNT2 are sodium-activiated potassium channels, i.e. they are permeable for potassium ions in response to sodium. Both channels are highly expressed in the nervous system are contribute to the slow hyperpolarisation after repetitive neuronal firing. Both ion channels are also referred to as SLACK (KCNT1) and SLICK (KCNT2), which should probably emphasize their role in the SLOW part of the hyperpolarisation. The action of potassium channels is needed to return the membrane potential after neuronal firing to the resting membrane potential. With more than 80 members, the family of human potassium channels is highly diverse, and probably many different potassium channels contribute to the overall potassium current during different stages of development. For example, KCNQ2 and KCNQ3 probably have an important role in the first months of life and mutations in the corresponding genes cause Benign Familial Neonatal Seizures (BFNS). While the precise role of KCNT1 is not yet known, some of the most recent findings are puzzling. The MMPSI mutations identified by Barcia and collaborators appear to be activating, i.e. increasing the potassium current. How an increase in potassium current translates into hyperexitability is difficult to explain. The increased potassium current would drive the neuronal membrane potential towards hyperpolarisation, thereby decreasing excitability. However, the authors also indicate that KCNT1 is highly expressed during neuronal development and may also have additional functions. A new spectrum? ADNLFE and MMPSI are two completely different epilepsy syndrome with no common denominator. 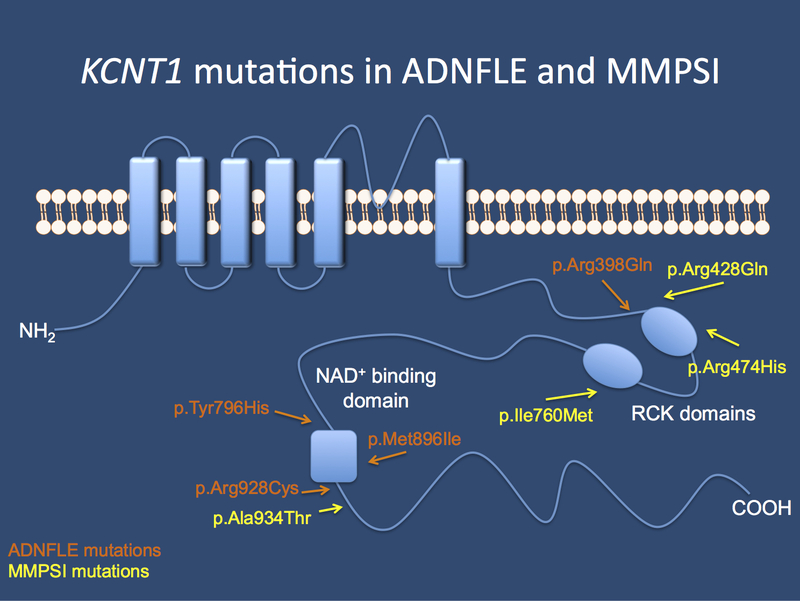 ADNFLE due to KCNT1 mutations starts in childhood and involves seizures from the frontal lobes, while MMPSI is a severe early-onset epileptic encephalopathy. While there are other examples of epilepsy genes involved in epileptic encephalopathies and familial epilepsies including SCN1A, GLUT1 and KCNQ2, some common phenotypic features can usually be identified. Further studies will tell whether this is also the case of epilepsies due to mutations in KCNT1. This entry was posted in 2012, Epileptic encephalopathy, Familial epilepsies, Publications and tagged ADNFLE, Autosomal Dominant Nocturnal Frontal Lobe Epilepsy, epilepsy gene, epileptic encephalopathy, frontal lobe seizures, KCNT1, Malignant Migrating Partial Seizures of Infancy, MMPSI, whole exome sequencing. Bookmark the permalink.